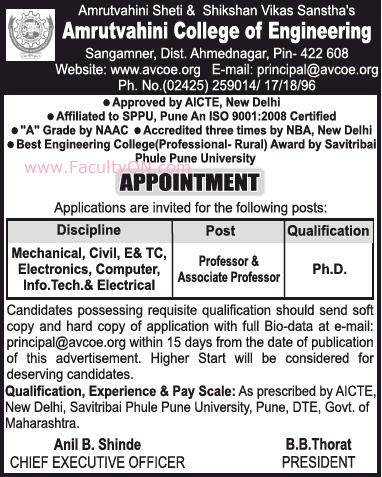 Amrutvahini College of Engineering, Ahmednagar has advertised for recruitment of Professor / Associate Professor jobs vacancies. Interested and eligible job aspirants are requested to apply within 15 days from 22nd November 2018. Check out further more details below. About College: Amrutvahini College of Engineering (AVCOE), Sangamner spreads over 25 acres of ample greenery, with three times accreditation by NBA, New Delhi and ISO 9001:2015 certified. It boasts state of the art IT centre with 100 mbps Wi-Fi Internet Facility. It has a huge library that accommodates 60,000 books and 9400 e-journals.